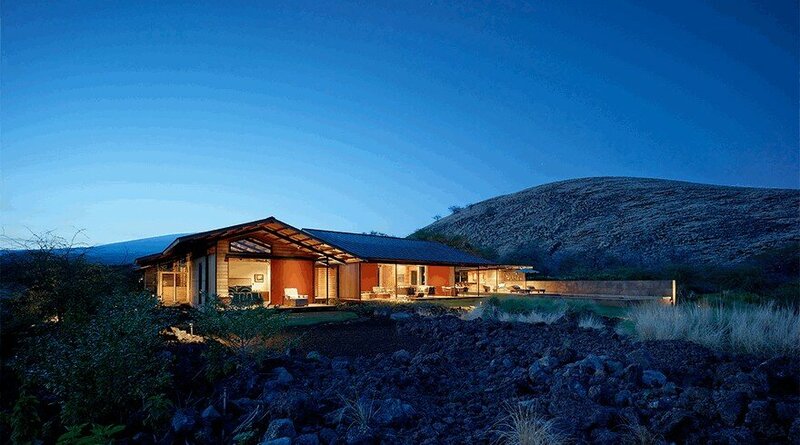 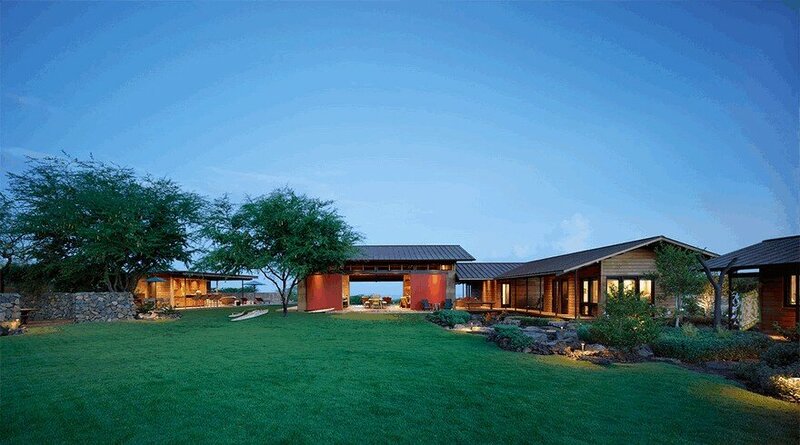 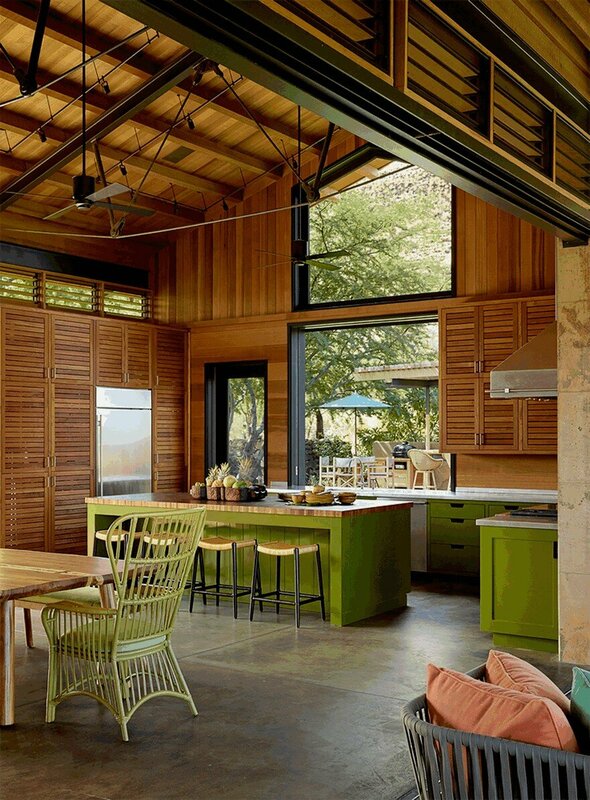 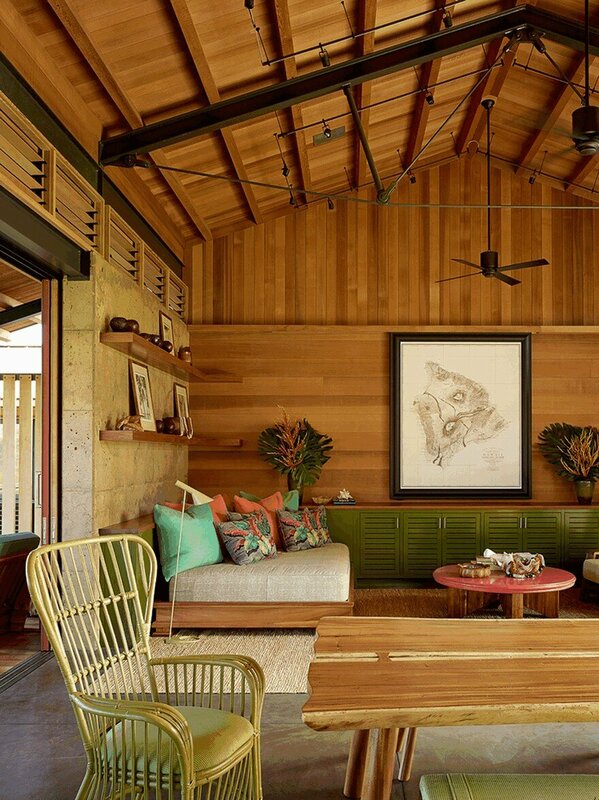 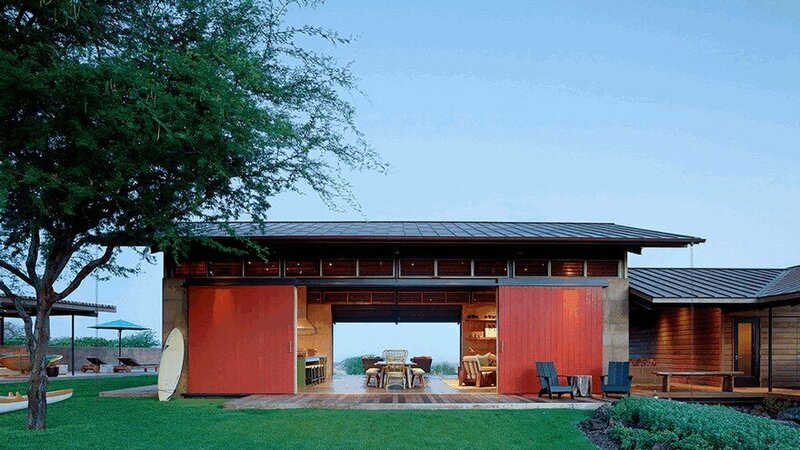 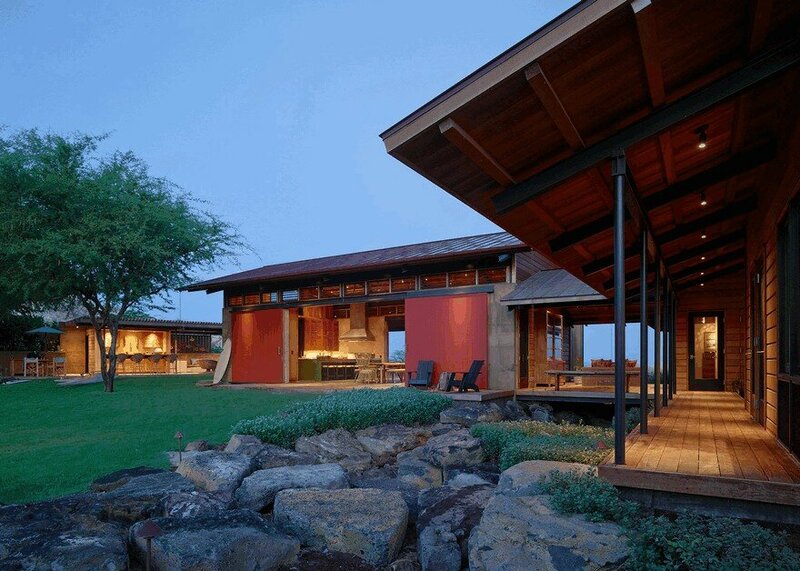 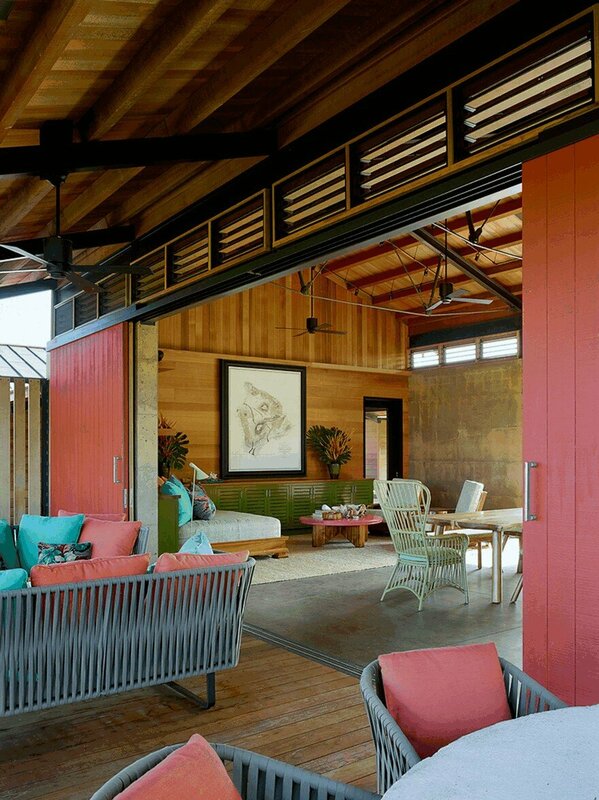 The Kahua Kuili residence was conceived as a modern interpretation of a classic Hawaiian summer camp. 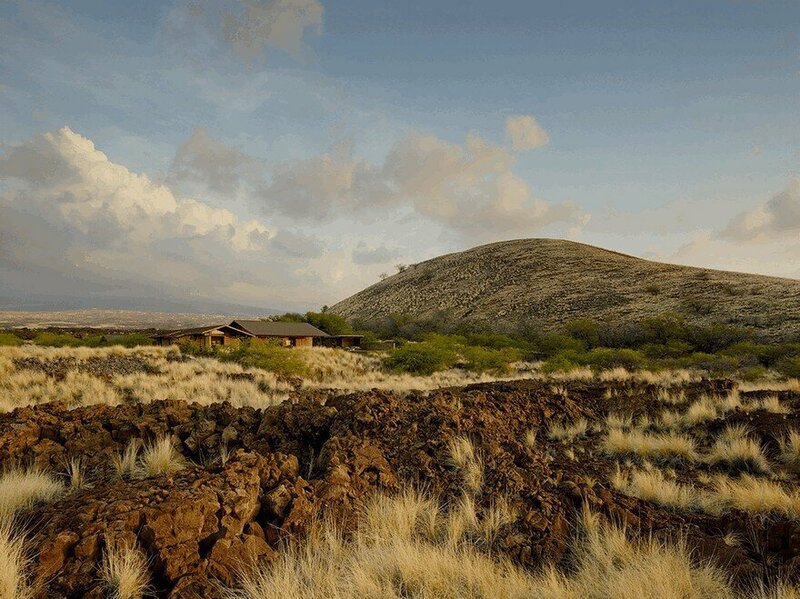 The project site is located at the base of the island’s large cinder cone, Pu’u Kuili, and offers expansive views of the Pacific Ocean and Kua Bay as well as mountain views to Hualalai. 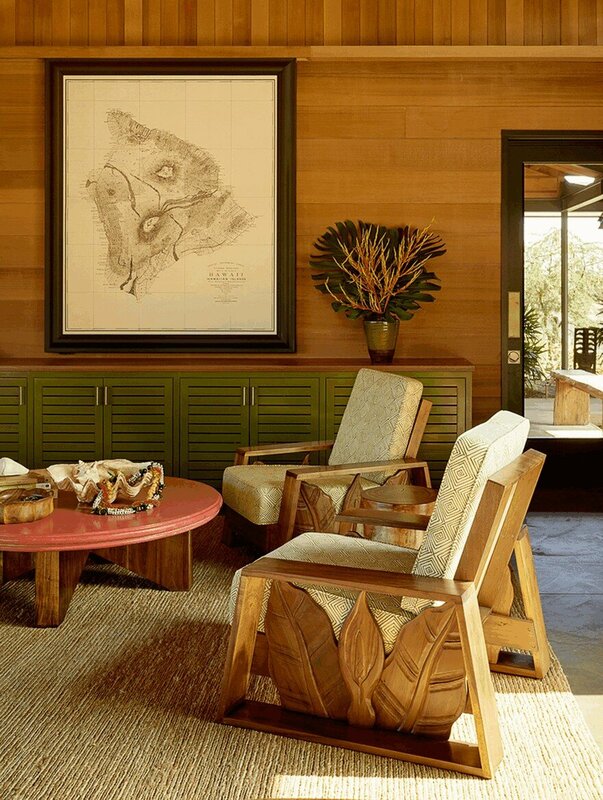 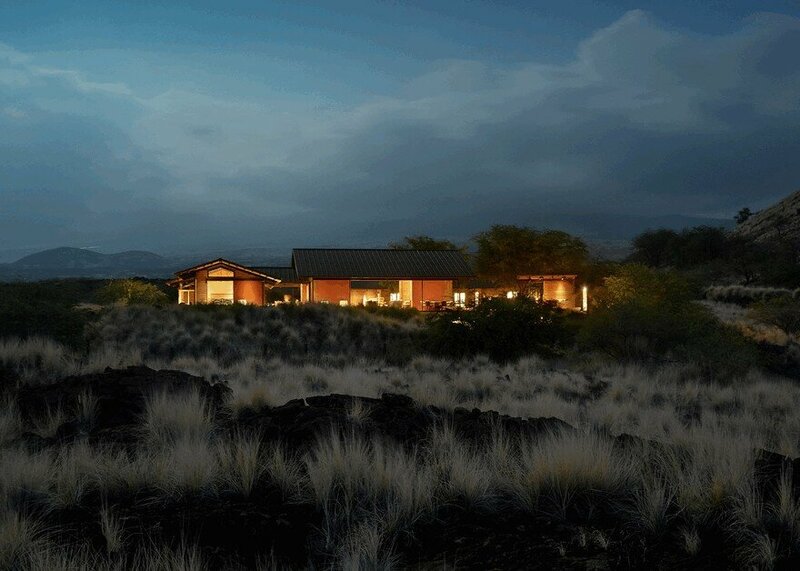 The property was originally used for ranching and, as such, the owners felt compelled to return it to its natural state with a mixture of lava and bunch grasses. 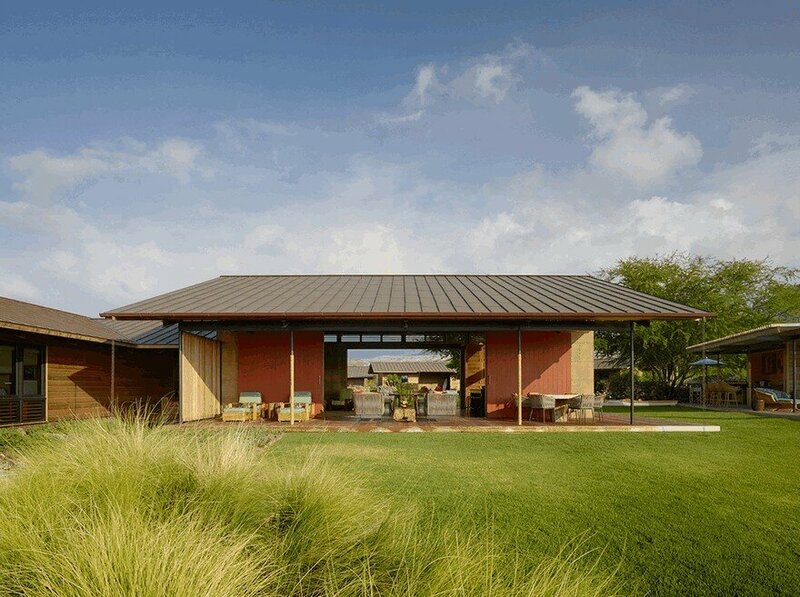 The buildings reinforce the camp-like aesthetic by utilizing simple, durable materials such as board-formed concrete, western red cedar, oversized sliding doors, operable wood ventilation louvers, and rope lashing. 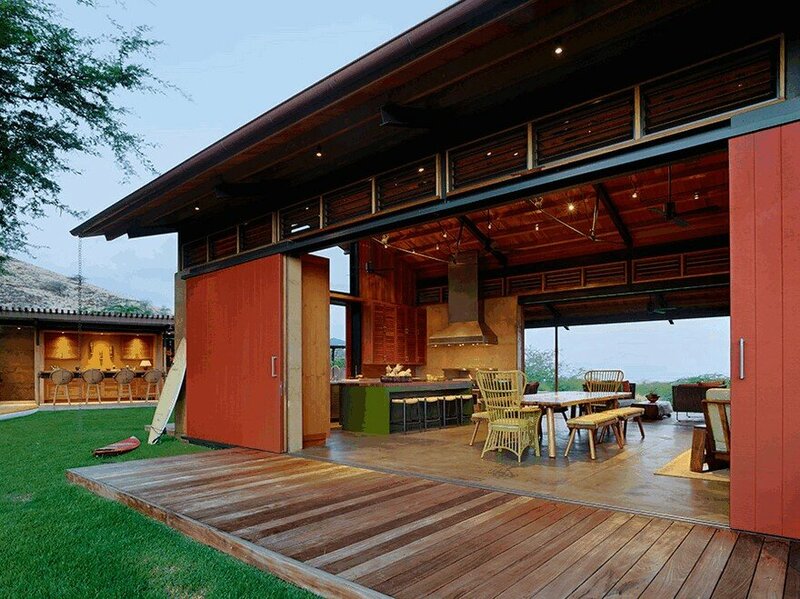 In fashion with traditional Hawaiian architecture, Kahua Kuili is made up of multiple communal hang out spots that allow for interaction amongst residents. 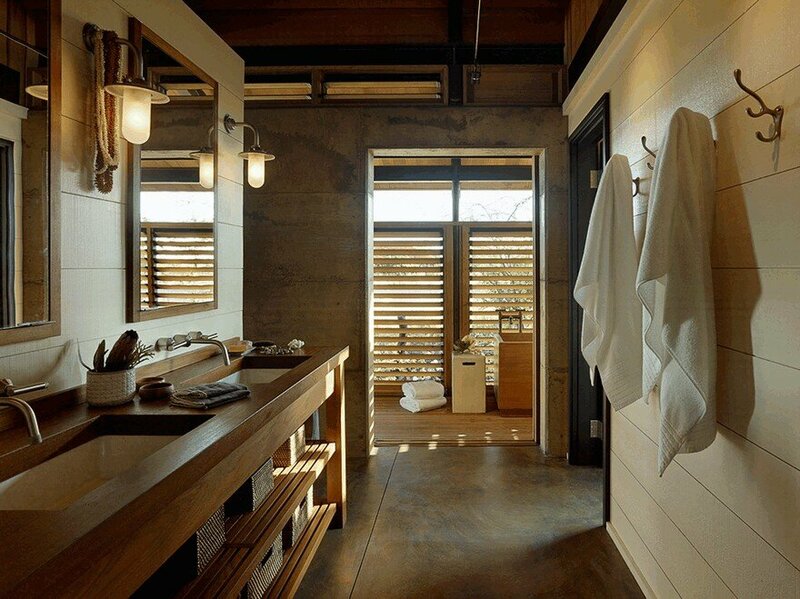 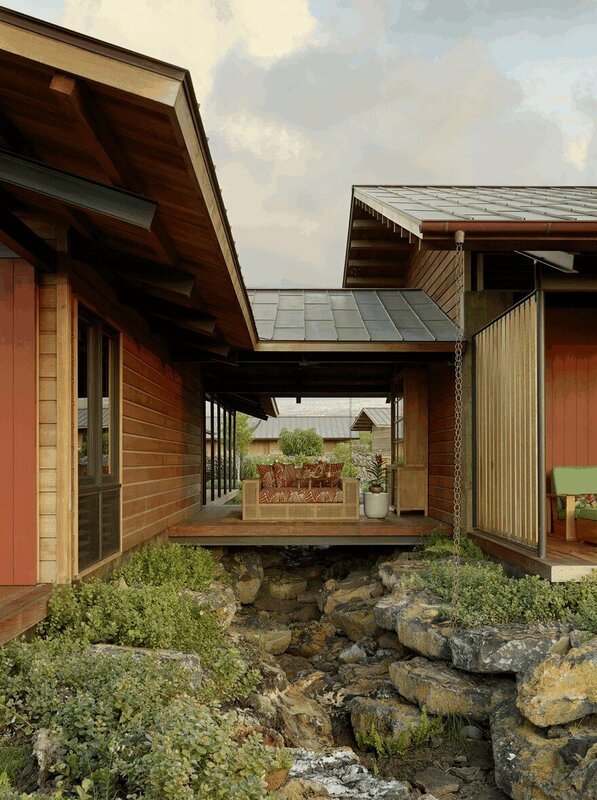 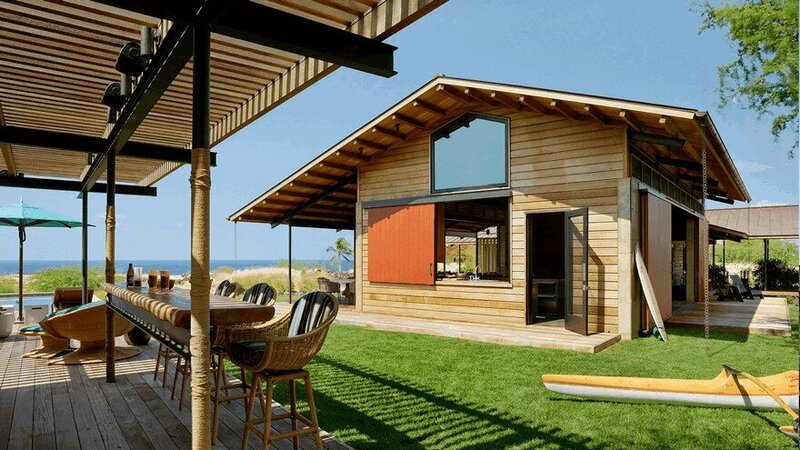 Constructed to be contextually appropriate to the natural terrain surrounding it, the exterior siding is made of Western Red Cedar while the interior is made of Western Red Cedar, painted poplar and concrete. 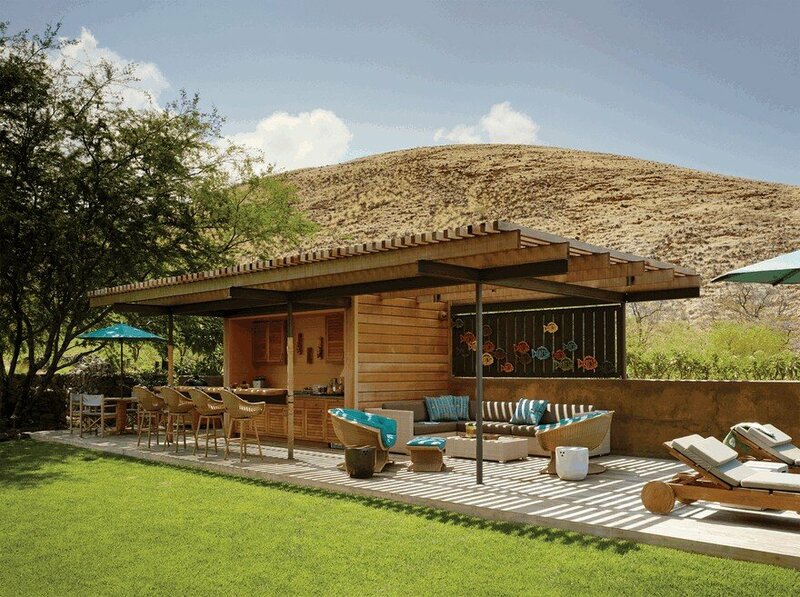 The commodious and open backyard includes a large overhang of Western Red Cedar that shelters a Tiki bar and cozy sitting area. 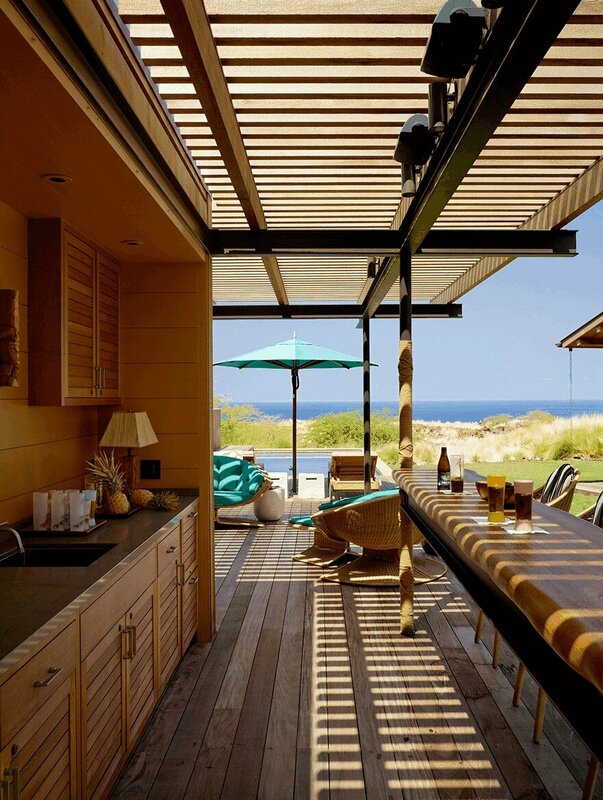 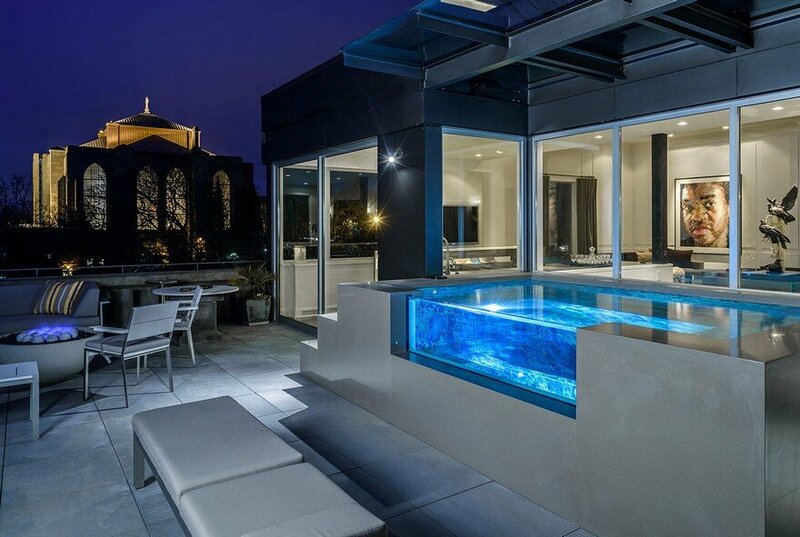 The bar/lounge area spills over into the pool, complete with multiple lounge chairs and breathtaking ocean views. 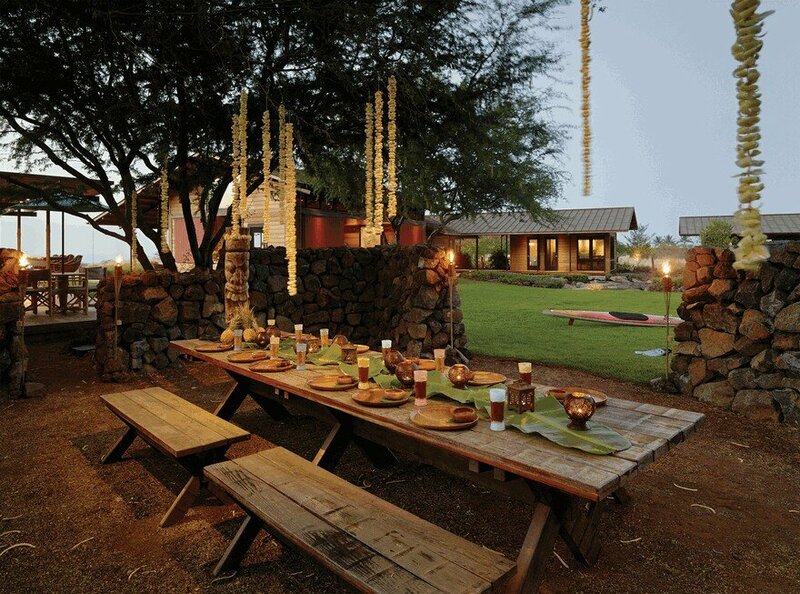 A BBQ/ Luau area allows for gatherings of family and friends who can picnic under the comfort and shade of a Kaewe tree. 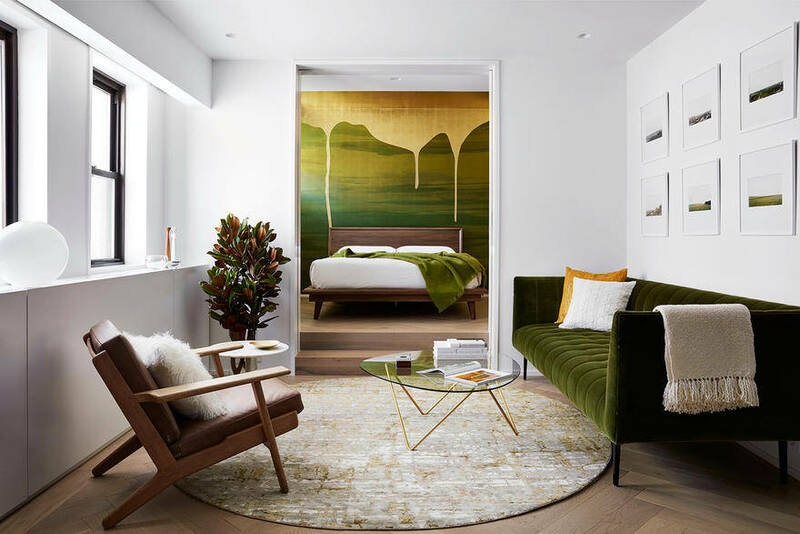 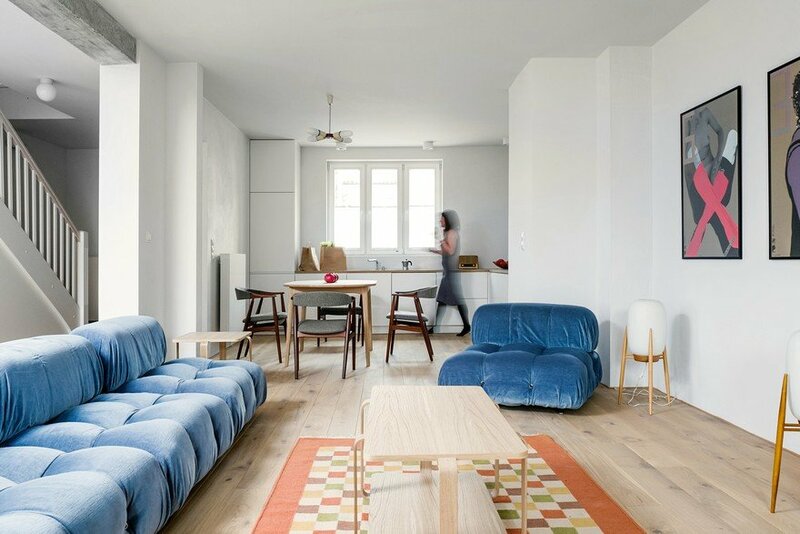 The interiors by Marion Philpotts were designed in a contemporary fashion with bright colors and retro elements that tie into the modern theme of the structure. 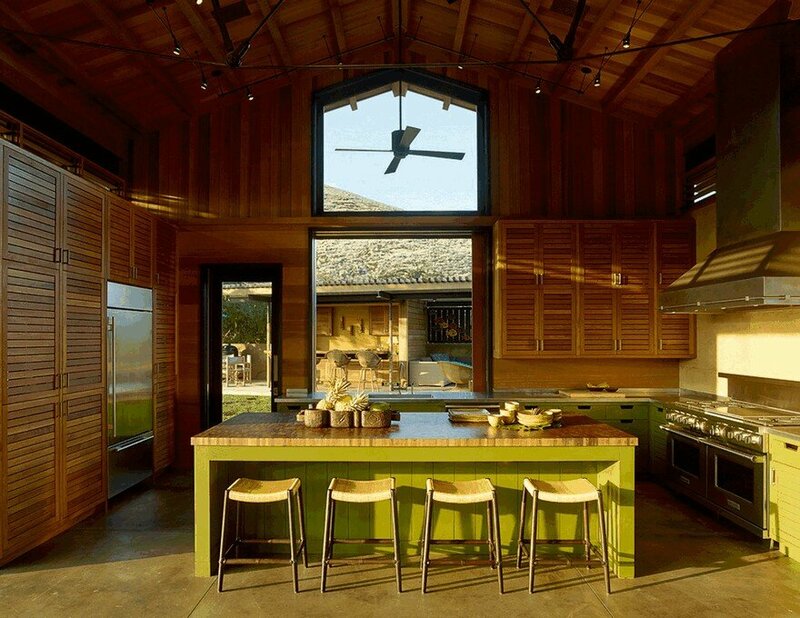 The expansive kitchen constructed in Western Red Cedar includes a breakfast bar, dining table and state-of-the-art appliances. 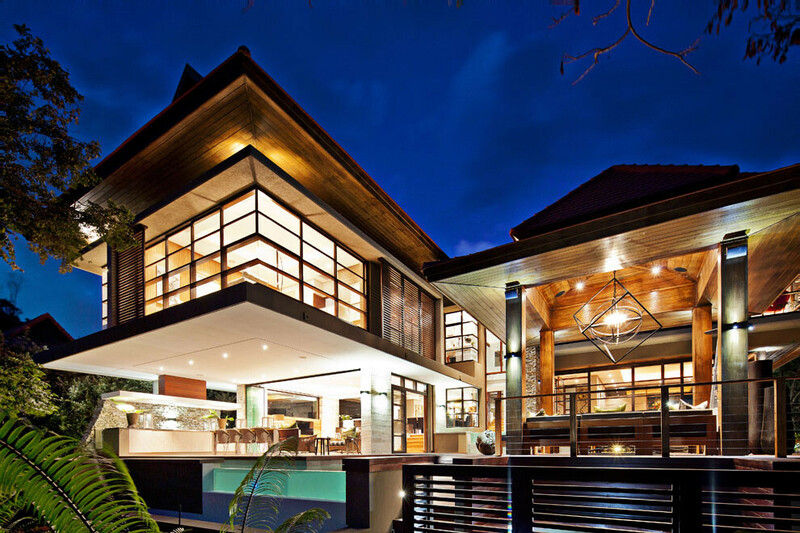 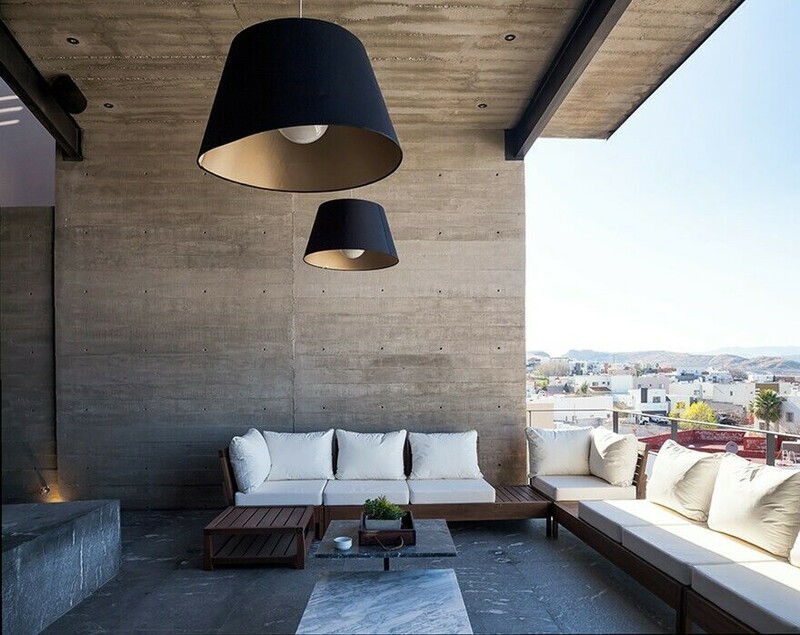 It’s tall ceiling, large windows and grand sliding doors that open to the backyard are cohesive with the open and airy theme of the house. 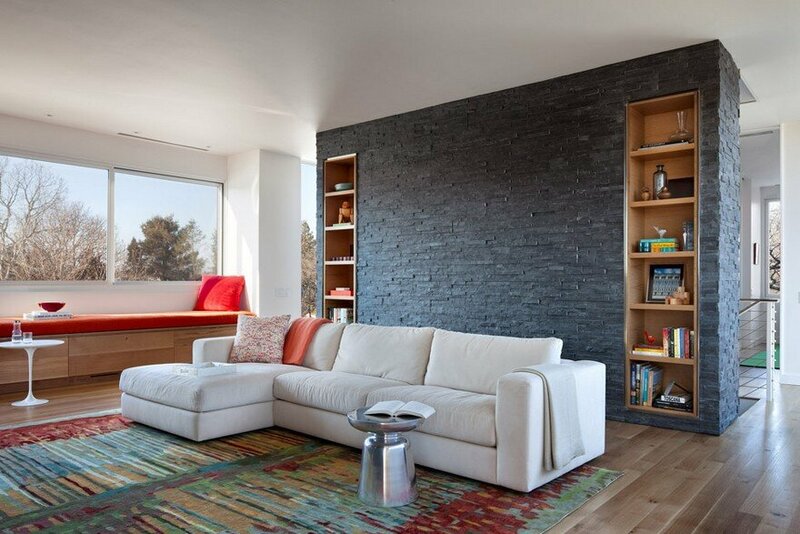 Intimate spaces for privacy are implemented throughout the home, including cozy reading nooks and relaxing sitting areas. 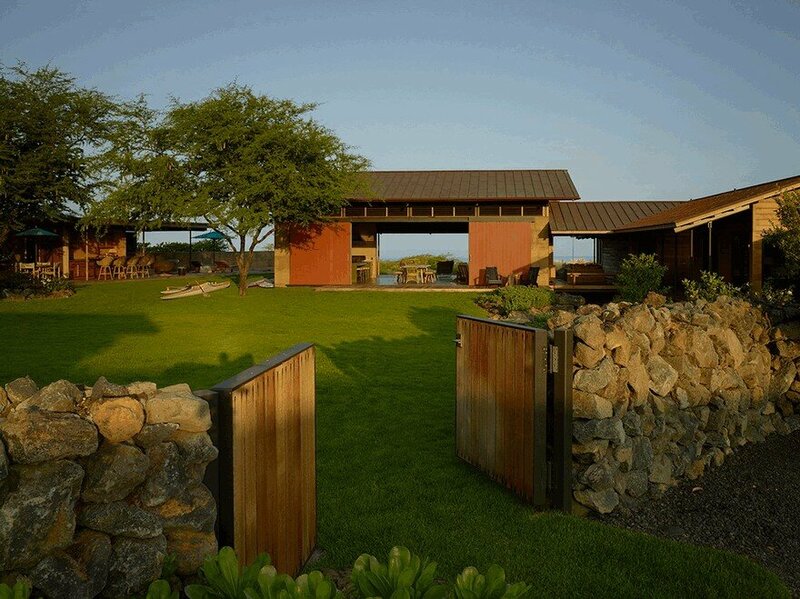 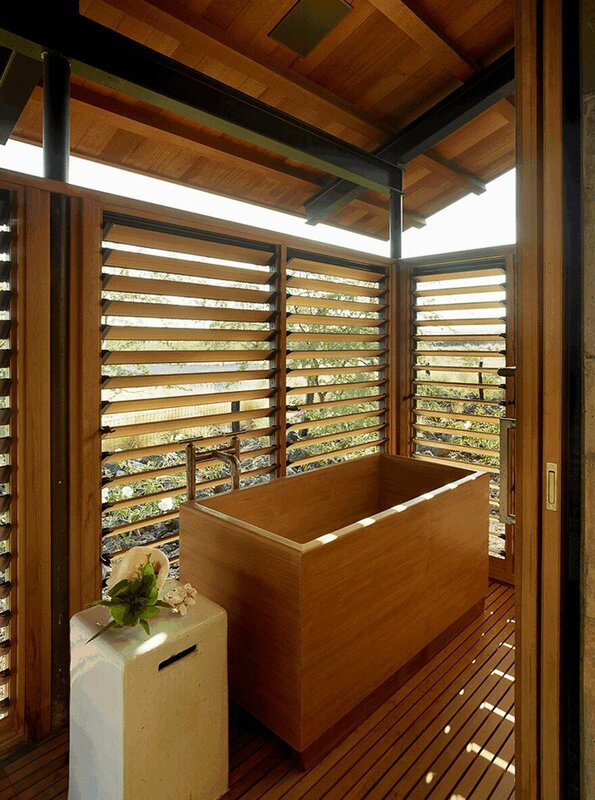 The residence offers the perfect place to unwind and relax while enjoying the natural climate and landscape of Hawaii.